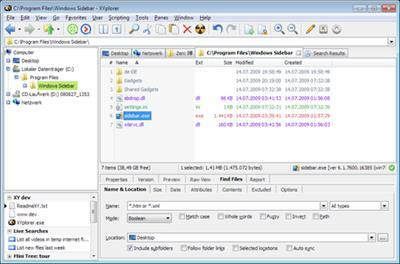 XYplorer is an Advanced File System Explorer targeting everybody who is looking for a real alternative to the Windows Explorer. It has the following features: Created Date, Last Accessed Date and Attributes are shown right in the file list. Extended file find supporting NT-only features, and including binary string search. Multiple location search (find files in all selected directories). Generates various sorts of file system reports (to clipboard, file, and printer - we are talking about one-click directory print-outs here). Export extended file informations of whole directories (or even directory trees) to CSV-formatted files. Column Width Auto-Adjustment.